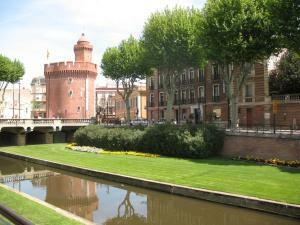 A stay at Hôtel Kennedy places you in the heart of Perpignan, within a 5-minute drive of University of Perpignan and Palace of the Kings of Majorca. This hotel is 9.5 mi (15.3 km) from Canet Beach and 11.8 mi (19.1 km) from Saint-Cyprien-Plage. Make yourself at home in one of the 25 individually decorated guestrooms. Complimentary wireless Internet access keeps you connected, and satellite programming is available for your entertainment. Detached private bathrooms with bathtubs or showers feature complimentary toiletries and hair dryers. Conveniences include phones, as well as desks and blackout drapes/curtains. When would you like to stay at Hôtel Kennedy ? If you are planning to arrive after 9 PM please contact the property in advance using the information on the booking confirmation. The front desk is open from 7:15 AM to noon and from 3 PM to 9 PM. Guests planning to arrive outside of these hours must contact the property in advance by using the information on the reservation confirmation received after booking. Each day we'll check prices and send you an email for your selected dates at Hôtel Kennedy. If you don't have specific dates but would like to check prices for say next weekend or say next month we can check the price too. Click to write a review and share your experience of Hôtel Kennedy with other travellers.